There are two routes connecting Amman with the south of Jordan: the Desert Highway and the Kings Highway. If your time is limited, use the straighter and faster Desert Highway. However, by far the more interesting route is the Kings Highway, which twists and winds its way through the heart of Jordan, connecting Madaba, Karak, Tafileh, Shobak and Petra. The Kings Highway is the worlds oldest continuously used communication route, and is mentioned early in the Bible. In Numbers 20, Moses requests the king of Edom to allow his people to "travel along the kings highway and not turn to the right or to the left until we have passed through your territory." The town of Madaba, located 30 kilometers southwest of Amman, is most famous for its exquisite 6th-century mosaics. Its history dates back at least 3500 years, however. Madaba, which was known in the Bible as the Moabite town of Medaba, is mentioned in the Old Testament account of Moses and the Exodus (Numbers 21: 30). David also vanquished an Ammonite and Aramean coalition near Madaba (I Chronicles 19: 7). His victory was short-lived, however, as in the mid-ninth century BCE the Moabite King Mesha freed the city from the control of the Israelites (2 Kings 3). Mesha, whose capital was the ancient city of Dibon (now called Dhiban, and located just north of Wadi Mujib), recorded his victories on the famous Mesha Stele, an inscribed stone set up in about 850 BCE. The rich farmlands around Madaba were coveted and fought over by the Edomites, Moabites, Ammonites, Israelites and other local kingdoms. The Ammonites had conquered Madaba by 165 BCE, but it was taken from them by Hyrcanus I around 110 BCE. His son Hyrcanus II later gave the city to the Nabateans in exchange for their help in recovering Jerusalem from Aristobulus II. Near the beginning of the second century CE, Trajan ousted the Nabateans from Madaba, and the city gradually became a Roman provincial town with the usual colonnaded streets and impressive public buildings. The Byzantine era saw Madaba enter its most affluent era. Grand buildings and a reservoir were constructed, while in the sixth century CE bishops were assigned to the city and a number of religious structures were erected. The importance of Madaba as a Byzantine ecclesiastical center is demonstrated by the wealth of elaborate mosaics scattered throughout the town. After the Persian invasion of 614 CE and a devastating earthquake in the year 747, the town was gradually abandoned. 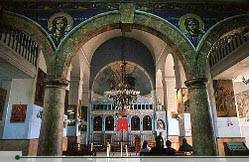 Madaba then lay virtually untouched until it was resettled in the late 19th century by Christians from Karak. 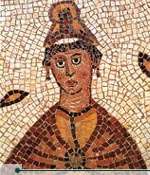 The citys greatest treasures, its mosaics, were uncovered then when these migrants were digging foundations for their houses. Madabas most famous mosaic is located in the Church of St. George in the middle of town. The Mosaic Map of Palestine represents the Holy Land and its surrounding regions. Clearly visible on the map are al-Quds (Jerusalem) and the Church of the Holy Sepulchre, the Dead Sea, the Jordan River, Nablus, al-Khalil (Hebron), Ariha (Jericho), Egypt and the Nile River, Turkey and Lebanon. The mosaic was made around 560 CE, originally composed of over 2.3 million pieces, and measured a staggering 25 by 5 meters. It is thought that 11,500 man-hours would have been required to lay the entire mosaic. The church is open to the public every day 08:30-18:00, except for Friday and Sunday when it is open 10:30-18:00. A small donation to the poor is requested. Inside St. George Greek Orthodox Church, Madaba. Madabas museum is located down a small alley a few blocks south of St. Georges Church. Just follow the signs. The museums greatest attraction is a collection of mosaic collages, some of which are in excellent condition. It was established on the site of an ancient chapel, so its own mosaics form the hub of the museums collection. The museum also exhibits traditional embroidered Jordanian dresses, and jewelry and pottery dating back to various ages. The museum is open Wednesday through Monday 09:00-17:00, holidays 10:00-16:00. Adjacent to the museum is an innovative mosaic school. In an effort to preserve Madabas heritage and develop its tourist potential, the Ministry of Tourism established the school to train technicians to repair and restore mosaics. It is the only project of its type in the Middle East. At the southern entrance to Madaba, near the Kings Highway, is the Church of the Apostles. The ruins of this Byzantine church date to 578 CE, and are currently being restored. One of Madabas most beautiful mosaics adorns the floor of this church. The mosaic is known as "Personification of the Sea" and it vividly depicts a woman emerging from the sea, surrounded by mythical aquatic creatures and a hodgepodge of rams, bulls, parrots and exotic vegetation. The mosaic was signed by a mosaicist named Salamanios. In addition to its spectacular collection of mosaics and Byzantine treasures, Madaba is also well known for its hand-woven carpets, saddle bags and tapestries. You can actually see them being crafted on the loom in several shops. To get to Madaba, take the airport road south from Amman. Turn off at the road to Naur and follow the signs to Madaba, which is about 30 kilometers southwest of Amman. The Madaba Visitors Center (tel. 08-543-376) is located in a white building near St. Georges Church and open Saturday through Thursday 08:00-14:00. Less than 10 kilometers west of Madaba is Mount Nebo, known as Pisgah in the Bible. It is where the Bible says Moses lived out his remaining days and viewed the Promised Land which he would never enter (Deuteronomy 34: 1-8). Mt. Nebo offers a fantastic view westward, with a vista that includes the Dead Sea, the West Bank, the Jordan River, and, on a clear day, Bethlehem and Jerusalem. There are actually two peaks on Mt. Nebo, Siyagha and al-Mukhayyat. During the sixth century CE, a Byzantine monastery was constructed at Siyagha. It was built on the foundations of an even earlier chapel, which was erected by monks from Egypt during the third or fourth century CE. Although little remains of the buildings that housed them, the mosaics of this period can be seen today inside the modern-day shrine atop Siyagha. The main mosaic, which measures three by nine meters, depicts the monastic pastime of wine-making, as well as hunters and an assortment of animals. Outside the building is an enigmatic Serpentine Cross. The figure represents the bronze serpent taken up by Moses in the desert, as well as the cross upon which Jesus was crucified. Just beyond Feisaliyya, a small town just east of Mt. Nebo, are the remains of the village of Nebo. The place, now known as Khirbet al-Mukhayyat, was mentioned in the Bible as well as on the Mesha Stele. Here, during the middle of the sixth century, villagers constructed their own church dedicated to the Saints Lot and Procopius. The floor was, of course, decorated with yet another rich carpet of mosaics which can be seen today. Travelers to Mt. Nebo seldom venture on to Khirbet al-Mukhayyat, so a brief detour here might be especially rewarding. The area of Nebo, Siyagha and al-Mukhayyat was purchased by the Franciscan Fathers in 1934. A road was built to connect the area with Madaba, and then excavations of the area began.